Benzie introduces MmmCraft's Twelve Days of Christmas, a guest curated Color Collection by designer and crafter Larissa Holland. Visit her pattern shop at www.mmmcrafts.etsy.com. Benzie's wool blend felt and DMC floss colors included in this collection are chosen to match the Twelve Days of Christmas ornaments. To purchase a set of felt and floss, select "felt+floss" from the drop down menu. Each collection includes 10 9x12" sheets and can make approximately 4-6 ornaments. To purchase the entire collection visit https://www.etsy.com/listing/534118709/mmmcrafts-entire-twelve-days-bundle-wool. 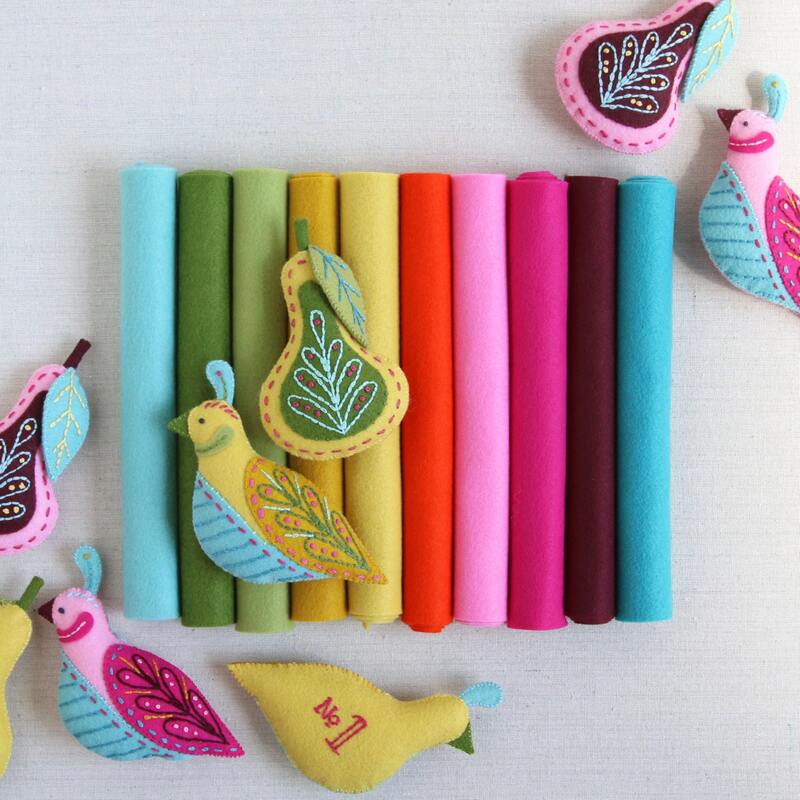 Bundle #1 includes Partridge and Pear & Swan a-Swimming felt colors: Swan, Moss, Fern, Mustard, Ochre, Orange, Pink, Magenta, Burgundy, Peacock. Bundle #2 includes Turtle Dove & Maid a-Milking felt colors: Peacock, Aqua, Swan, Magenta, Burgundy, Orange, Mustard, Ochre, Silver and Graphite. Bundle #3 includes French Hen & Drummer Drumming felt colors: Chartreuse, Julep, Blue Spruce, Aqua, Coral, Swan, Orange, Mustard, Castle, and Copper. Bundle #4 includes Colly Bird & Piper Piping felt colors: Black, Graphite, Julep, Moss, Coral, Mustard, Peacock, Cyan, Copper and Orange. Bundle #5 includes Golden Ring & Lady Dancing felt colors: Ochre, Mustard, Castle, Copper, Swan, Peacock, Pool, Blue, Flamingo and Magenta. Bundle #6 includes Goose a-Laying & Lord a-Leaping felt colors: Aqua, Icicle, Blue, Cyan, Periwinkle, Coral, Fuchsia, Pink, Copper and Orange. Wool felt is one of the most versatile and beautiful fabrics to create with, a blend of 20-35% merino wool with the remainder viscose make it resistant to pilling and pulling, easy to cut, affordable -all working together to provide maximum craft-ability. Benzie's felt is approximately 1mm thick. Our carefully curated rainbow includes a wide variety of brilliant and pure colors and is available in cut sheets and yardage. We are honored to be the largest supplier of wool blend felt on Etsy for over five years. Beautifully packaged and the colors are fabulous! Fast shipping too! How do I select the colors I wish to purchase? View our online swatch chart (shown in the second image of all custom listings) to make a a custom selection of colors. Make note and type these colors in the "message to seller" box at checkout. I forgot to add something to my order! Can you combine orders? We make every effort to combine multiple orders -but we process orders quickly here -so it may be too late! Leave us a note with your order and we will do the best we can. Ordering more items will result in an increased shipping cost -if we find any shipping overages we will most certainly refund. How much does it cost to ship my item? Shipping costs are listed under the 'shipping & policies' tab in each listing. For purchases including multiple listings we suggest looking at your cart for an updated shipping price. Over at www.benziedesign.com domestic customers receive free shipping at purchases over $85.00.